Don't worry - Ofcom will ensure that everyone effected by 4G interference will still be able to watch digital television, and at no cost to the affected viewers. Ofcom has estimated it will cost £100m to deal with Freeview users who are located near to the transmitters for the next generation of mobile broadband services, which will use the frequencies (791 to 862 MHz) previously used for analogue television. Once switchover is complete, over 10 million homes in the UK will use Freeview for their only television reception, and almost all of the remaining 17 million homes will use the terrestrial digital television service on their secondary TV sets. The signals are provided from two types of transmitter. First there are around 80 high power transmitters located on hills that serve very large areas, such as the Crystal Palace transmitter (4.5 million homes in London), Winter Hill (2.7 million homes in the North West of England) and Sutton Coldfield (1.8 million homes in Birmingham). In addition there will be over 1,000 fill-in Freeview light transmitters, such as Boddam, which serves just 600 homes. In contrast, the new 4G mobile services will use around 9,000 smaller transmitters located near where the services are required, which follows the current model for mobile phone networks. Signal overload - when a Freeview receiver is overloaded because the total input signal level is more than a certain level, the whole receiver will stop working and all television services will be lost. Signal-Interference Noise Ratio degradation: this is where reception breaks down because the receiver can no longer decode the digital information in the transmission. This could affect a single multiplex or could take out all services. The types of Freeview installation, with single unamplified aerials to a single set have the best resilience, with communal and systems with amplifiers more likely to suffer. The 4G transmissions are capable of overloading most types of TV amplifier. 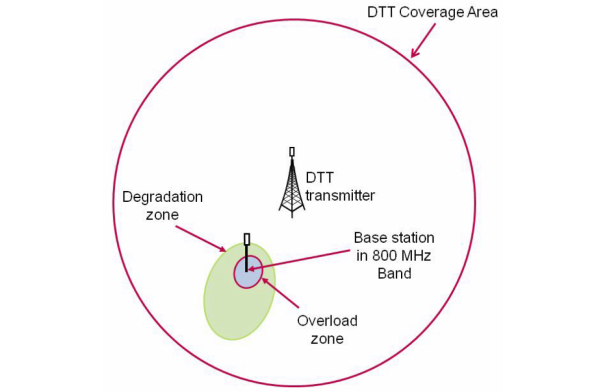 The frequencies used for the DTT services being received, with those on the adjacent C60 being worst, C52 to C59 second worst and those on lower frequencies having the best chance of avoiding interference. The strength of the Freeview signal received is another factor, with those with weaker signals due to being distant from the Freeview transmitter, having the most potential for 4G interference. Not all 4G transmitters will use the same frequency, those that happen to use the lower frequency allocation having the most potential to cause Freeview interference, and those that transmit at higher power levels having more effect than low power 4G transmitters. Of the 16.3 million UK homes with a standard (unamplified, unshared) Freeview reception, 110,000 (0.67%) would be effected. Of the 5.2 million homes using communal aerials systems, 550,000 (10.6%) will have problems. Of the 5.6 million homes using amplified Freeview reception, 100,000 (1.8%) will experience problems. There are several ways to deal with these 760,000 homes that will have problems. Use of signal filters for the Freeview reception combined with Fitting of filters at 4G transmitters. Ofcom's modelling finds that this is the most effective way of dealing with the 4G interference problems. Of the 110,000 standard Freeview installation homes, 87,000 will have their reception restored this way, almost 100% of the 550,000 homes with communal systems will be mitigated with filtering and 93% of the 100,000 domestic installations with amplifiers. The total cost will be £20m for the Freeview filters and £33m for fitting of the filters in homes. Also, for the domestic filtering to be effective, the 4G providers will also have to spend around £11 fitting filters at the 4G transmitters when they are being installed. After the provision of filters, there will still be 23,000 homes with unamplified and 7,000 homes with amplified Freeview reception equipment that are unable to receive their services. Some of these homes will simply need a new Freeview box for each TV set. Whilst these boxes cost around £15, the requirement to fit these and provide for each set could come to as much as £200. Another option, for at least 20% of homes, is to receive the Freeview services from an alternative transmitter. However, this could lead to the provision of the 'wrong' version of BBC One, BBC Two, ITV1 and Channel 4/S4C to the home. Ofcom is unsure if this will be an effective mitigation. The use of On Channel Repeters (OCR) to rebroadcast the Freeview signals at higher power levels in the interference area was considered by Ofcom, but the high cost and unknown effectiveness has caused them to be distrgarded as a viable option. Because of several factors, Ofcom does not consider that this will help prevent 4G interference of Freeview reception. Ofcom have concluded that causing service reception problems for the new 4G mobile services is undesirable for the services to be successful. This leaves providing a replacement Freesat installation (including multiple sets and Freesat+ boxes) for the 30,000 homes with their Freeview reception disabled, or the funding of a basic Virgin Media package. The total cost for this is £10m. John Anderson: There is no transmitter issues, so please have a look at Freeview reception has changed? | Freeview Interference | ukfree.tv - 11 years of independent, free digital TV advice . Philip: Have you phoned them to tell them that you have these complexities? They do have a very large fund to fix the interference problem for every single person effected. No one should have to fork out anything. Philip: In addition to Briantist's query/advice, have you checked with any of the other residents in the block to ascertain if they are also experiencing similar problems as yourself? Also, have you already installed the 4G filter in line with the jumper lead that goes into your TV's aerial input socket? Finally, on the subject of 4G, have you actually been informed that you are located close to a number of 4G transmitters in the area? Edward anderson: Freesat is unaffected by signals from mobile phone masts as they are will not be picked up by a satellite dish, also the frequencies used to broadcast satellite TV are nowhere near to those used by any current mobile phone/broadband technology. And why dont you just ask for a 4G filter - they are free. In fact, shouldn't you have been given one, being so close to mobile masts? One thing does occur - most people DONT now need a booster - check your signal strength.